Our client uses some third party software and devices for their internal work. They print 600 pages per shift and now they wanted to eliminate paper usage without changing their existing systems. There are LaserJet printers that are connected with desktop PCs and thermal printers that are connected with some small handheld devices which read data from third party cloud server. 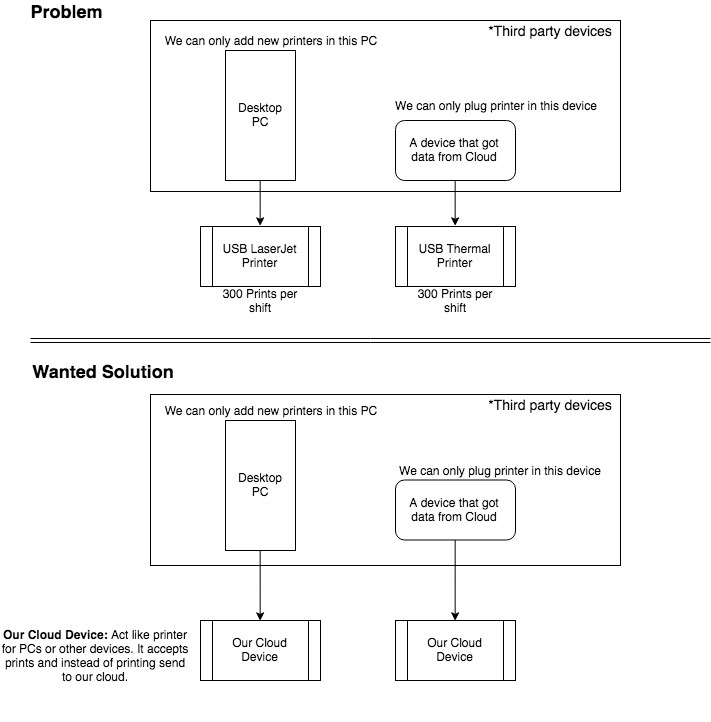 I was wondering if we cloud make some kind of programmed wifi enabled USB device (lets say ESP8266) that acts like a printer for PCs and handheld devices. When this device is connected it should be detected as printer and what it does is simply accepts prints and send it to our cloud server. I know how to deal with all the cloud communications. What I just wanted to know is how to make my device detected as printer and access the file? Do I need to burn some kind of printer drivers in it or what. I know that there are various apps for print to pdf but we cannot use them because we dont have rights to directly copy files from these systems. External storage is disabled and we cannot even copy files and send over internet from this restricted pc. So we have only option to read that is coming to printers. You could just purchase commercial products that do this. But rolling your own is possible. An ESP8266 would be too limited for this. It's meant to be a serial to wifi adapter with some extra GPIO. Instead, a computer with usb OTG or peripheral ports and linux using something like USB Gadget Printer drivers that allows you to emulate a printer to the host computer. Obviously this will require some intermediate to advance coding to figure out. Once you have that set up, the print data can be forwarded, as it's likely in a standard PCL format. The time and skill needed should be compared to the commercial product cost. Not the answer you're looking for? Browse other questions tagged arduino driver esp8266 usb-device or ask your own question. How to send raw data to IEEE-1284 Parallel Printer Cable? Arduino smells burnt but works fine, what shall I do? Can a Bluetooth wireless connection bridge a USB Host and USB device?